Here are some useful foodie websites. Laura lives on the Riviera and makes videos of the markets and restaurants there. A high-end global luxury lifestyle magazine with jet-set tips and restaurant articles by their eminent restaurant critic, a certain Andy Hayler. A large on-line community with local sub-groups that arrange gourmet events. This company are wine suppliers, but also have a useful section on their website highlighting high end restaurants around the world with good value wine lists. Very good photos in this guide to restaurants, initially mainly New York but expanding beyond this. This niche producer makes superb olive oil; I use this at home, and it is the choice of many demanding chefs. American author Daniel Young lives in London and has a passion for finding the best coffee, pizza and burgers available. Looking for good value wine? 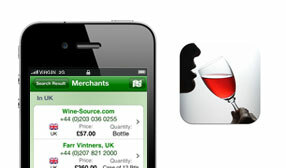 My wine search app tells you which merchants stock a particular wine and at what price, allowing you to compare the price on a restaurant wine list or in a shop with the retail prices being charged elsewhere.